It could refer to a number of things – the mammoth multi-car wreck that is a familiar result of Talladega’s high-speed, close-quarter racing. Or the sheer enormity of the speedway itself with its 2.66-mile layout and 33 degrees of banking. Or the amount of strategy it takes to succeed, luck it takes to survive, and focus it takes to win. “The big one” can mean a whole lot of things at Talladega. 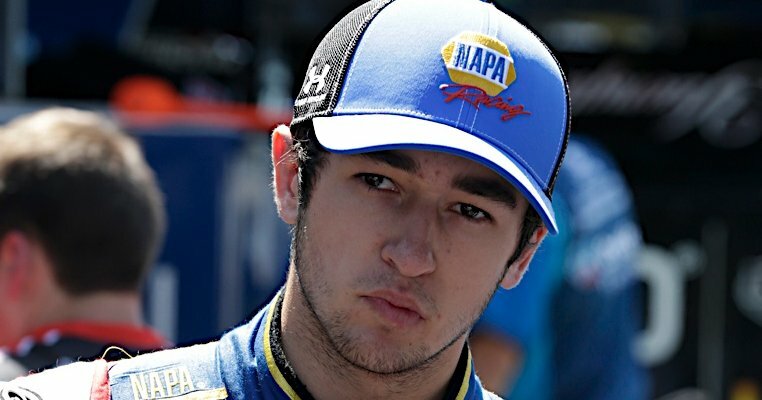 Despite never having raced there before, Chase Elliott knows all these things about Talladega and embraces the challenge. Perhaps his confidence derives from several places. For starters he enters the second restrictor-plate race of the season atop the NASCAR Nationwide Series point standings (+19 to teammate Regan Smith) and leads the Sunoco Rookie of the Year race by 34 points over Ty Dillon. Also, he is coming off his third consecutive top-two finish. And then there is this – while Elliott may never have raced at Talladega, his crew chief, Greg Ives, has. And Ives won this race last year with Smith behind the wheel. Surviving the carnage of the early wrecks and positioning the No. 9 Chevrolet for a final-lap strike will be the strategy for the NAPA team for this 117-lap Aaron’s 312 (3 p.m. ET on ESPN and MRN/SIRIUSXM). Elliott will have some experience to lean on, as the 18-year-old racer was shuffled out of line on a late restart in his first race on a superspeedway track this year (Daytona on Feb. 22). Elliott finished 15th in that race but made a huge impression with his ability to race against the best. ”You have to take what’s given to you some weeks and move on. That’s what my NAPA AUTO PARTS team did in Richmond last week. I think it’s good for our organization with what everyone’s doing, not just at the race track, but back at the shop. I’ve said this a lot the past couple of weeks, but they’ve made a lot of changes this offseason from cutting bodies off these race cars to front clips, to rear clips, pretty much wholesale changes. Almost restarting as an organization. Especially with us running three cars most weeks, it’s put a lot of guys to work and a lot of long hours, but these cars are capable of winning each week. I’m just fortunate to be in a position to drive them.